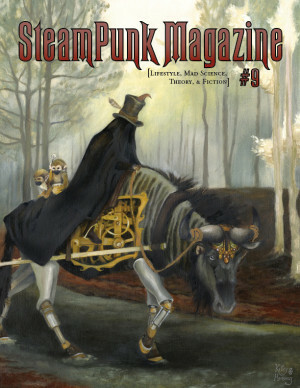 As the final decades of the 19th Century wound down, a plague of mythical proportions struck the Northern Hemisphere. Vampires rose up from the cool, dark places of the earth, slaughtered every human in their wake, and plunged the entire world into chaos (and an inevitable dystopia, of course). Two hundred years later, the descendants of the northern refugees have created new empires around the equatorial regions and the Southern Hemisphere. The warmth, antithesis to the vampires, keeps them in relative safety. Enter Princess Adele of the Equatorian Empire, touring the fringes of human territory. This is, of course, an effort to stall an arranged marriage with the boorish American, Senator Clark, as her father’s empire stands on the brink of war and she loathes such a distraction. A sudden vampire attack separates her from her brother and retinue, and plunges her into vampire territory and the company of the enigmatic, vampire-slaying folk hero known only as ‘Greyfriar. ‘ As her sword-wielding compatriot leads her far north into the heart of what was once the British Empire, two questions remain: Can she keep her father from plunging their empire into a catastrophic war, and—of course—can she escape a poorly-matched marriage to a blinkered warmonger, intent on stealing her own crown and inheritance? For once, the synopsis on the jacket reveals to the reader precisely what they will find inside. What it doesn’t prepare the prospective audience for is the woeful predictability of the story. Even one of the characters’ big reveal is ruined almost as soon as they are introduced thanks to particularly ham-handed foreshadowing. It seems the pulpy nature of the story makes it formulaic in a very painful way. And, indeed, The Greyfriar is one of the pulpiest books I’ve ever read. While the authors make a valiant attempt to both combat this, as well as spice up the prose (which often waxes purple), it lacks a certain finesse. Puns are scattered throughout the narrative, but they barely distract a reader from the awkward pulpiness. Even more mind-boggling is the fact that, despite being a refugee group in this world, Europeans still seem to own everything. The same can be said of Americans, as well. Some very heavy-handed attempts at social commentary seem to be present, but the characters involved aren’t written well enough to make them a driving point in the story (in fact, it makes said characters incredibly annoying). However, the authors are to be commended in their own way. 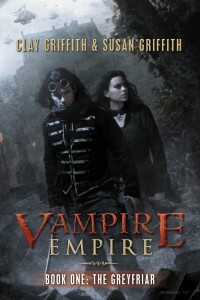 There are some readers who find their stomachs turned by the very mention of a vampire novel (myself included). Very few authors can write one and come out of that mess seeming even halfway competent. The Greyfriar is a different story. The vampires, thankfully, are actually terrifying in their own world. For the most part, the vampire characters aren’t overly romanticized—thankfully. They are meant to be a nearly-insurmountable obstacle, and the Griffiths most definitely present them as such. Furthermore, while the usual vomit-inducing romance is still there, it is downplayed. The focus remains on character and action instead. There is even enough momentum in these action scenes to catch and throw a reader through a fourth of the book at a time. Adding to the narrative pace, a heroine who stands her ground (the usual damsel in distress and tower-rescue scenes aside) without worrying about her clothes (even though she worries about her love interest) every waking moment was a breath of fresh air—especially in a genre prone to such juvenile stereotypes. 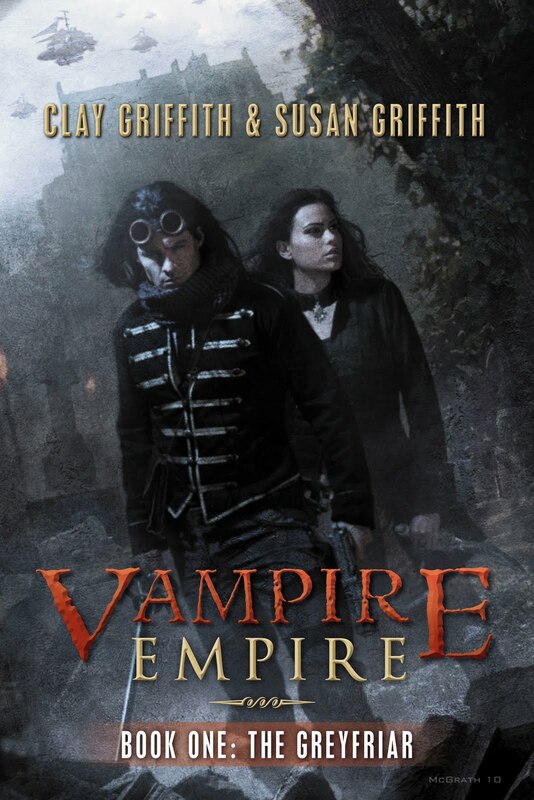 On the subject of genre, the first installment of this series seems to accomplish something most steampunk books do not: steampunk as an atmosphere rather than a contrivance. Not only does it work well with the somewhat post-apocalyptic world, the genre elements are in the background where they belong, rather than being used as a blunt object with which to bludgeon the reader senseless. With all that in mind, while The Greyfriar is squarely in the ‘mediocre’ range, it makes an enjoyable fluff read for anyone who likes a bit of pulp with their supernatural fiction. Well, if you can ignore the confusing cultural structure of the Equatorian Empire, that is.